This review deals with the chemistry and application of coordination polymers in catalysis. Coordination polymers have been classified into three catalogues, metal-organic frameworks (MOFs), amorphous coordination polymers, and metal-organic gels (MOGs). In the part of MOF, catalysis on the nodes (metal centres) and the connectors (organic ligands, metalloligands) of MOFs, and catalysis of supported metal complexes and metal nanoparticles in MOFs are discussed. To immobilise coordination complexes in amorphous coordination networks, five strategies have been reported: 1) self assembly of metal ions and organic ligands, 2) use of metalloligand, 3) use of mixed organic ligands, 4) use of mixed metal ions, 5) link by supramolecular forces. To get catalytically active MOGs, three methods are feasible: 1) gelation by coordination polymers; 2) gelation by discrete metal complexes; 3) post-modification of a preformed gel with catalytically active centre. This article discusses extensively the application of coordination polymers in catalysis. 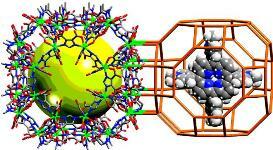 It aims to bridge the areas of coordination polymers’ chemistry and catalysis.